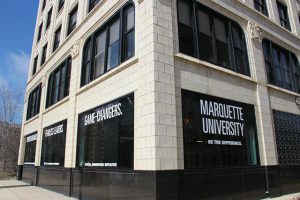 Marquette University launched the 707 Hub, a new collaborative shared space for students to innovate ideas and become entrepreneurs. It is open to all Marquette students as well as faculty and staff and features collaborative workspaces, conference rooms and meeting areas. In addition, guests have access to a variety of tools and technology such as 3D printers, hand tools, sewing machines, computers and other business development resources. The space is home to both the Kohler Center for Entrepreneurship and university’s Social Innovation Initiative and will also be used for presentations and special events. For more information, please visit the Marquette 707 Hub website.